Prontolind Spray is a ready-to-use, aqueous solution for antiseptic cleansing and moistening of fresh and problem piercings. Areas of the skin, mucous membranes and jewellery that are hard to reach can be cleaned painlessly thanks to the spray application. The ingredients have been used successfully in clinical practice millions of times over, are safe for dermatological use. They do not demonstrate any cytotoxic, inflammatory, irritating or sensitising properties and can be used safely over long periods of time. 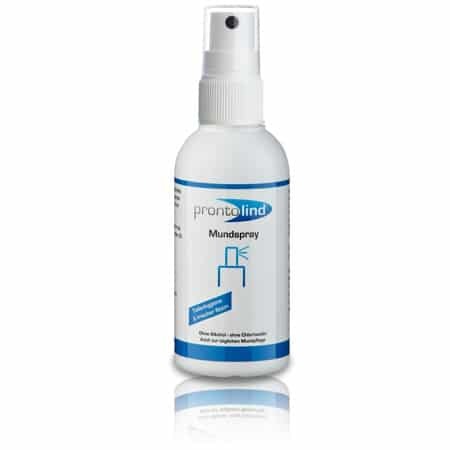 In addition Prontolind Spray provides protection from multiresistant (MRSA) and mycotic pathogens and is tolerated well by diabetics and those suffering from allergies. The polyhexanide betaine complex contained in the ingredients decontaminates even areas that are hard to reach, and eliminates unpleasant odours. Dispersion of pathogenic, transient and resident bacteria in the piercing hole and around the jewellery is thus prevented. Prontolind Spray is compatible with all jewellery materials. The ingredients have been used successfully in clinical practice millions of times over, are safe for dermatological use. They do not inhibit granulation and epithelialisation, do not demonstrate any cytotoxic, inflammatory, irritating or sensitising properties and can be used safely over long periods of time. Thanks to the resulting protective film and the broad microbial spectrum, it prevents new infectious agents from implanting themselves. Dispersion of pathogenic, transient and resident bacteria in the piercing hole, around the jewellery and on the tattoo is thus prevented. In the case of flesh tunnels, Prontolind Gel prevents and reduces unpleasant odours to a minimum and can also be used as a lubricant gel for expansion (e.g. ear holes). 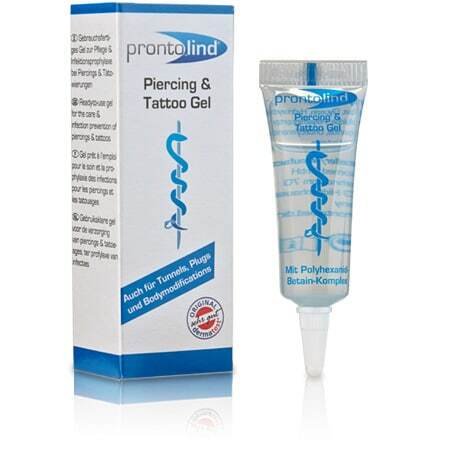 Prontolind Gel is especially suitable for use with nasal and ear piercings, dermal anchors and microdermals. Prontolind Gel is compatible with all jewellery materials. Ideal for studio and home use. Minimizes secondary bleeding, redness and swelling. 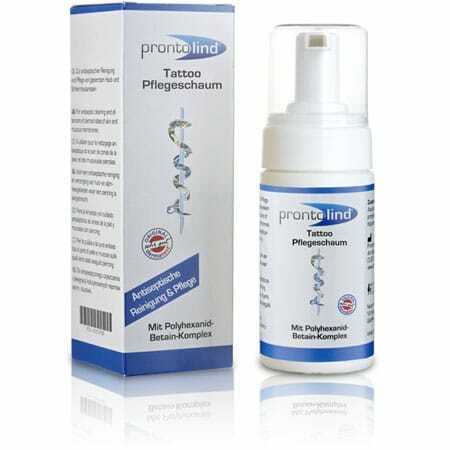 The Prontolind Tattoo Care Foam in the practical 100ml dispenser nourishes, protects and regulates the tattooed skin, ideal for daily care during the healing period. The contained polyhexanide-betaine complex minimizes inflammation, redness and crust formation. Nourishing panthenol improves the skin’s appearance and supports regeneration. The care foam contains no fragrances or other harmful ingredients and is therefore particularly suitable for sensitive and irritated skin. The Prontolind Tattoo care foam minimizes bleeding and soothes the skin (reddening and swelling immediately). The colour brilliance is optimally maintained. For all piercings in the oral area, also suitable for daily dental care! 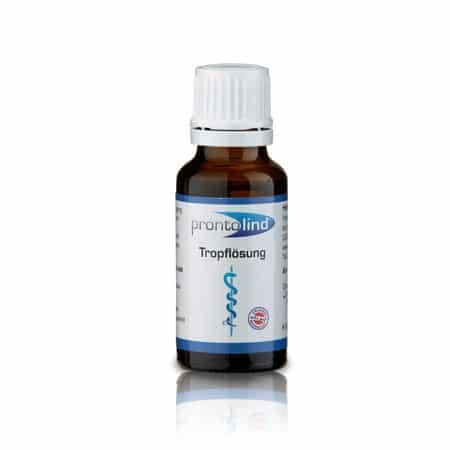 The Prontolind mouthwash promotes healing after tongue and lip piercings. The mouth rinsing solution maintains and cleans the mouth rinse without any harmful ingredients such as chlorhexidine, sugar or alcohol. In addition, the mouth rinsing solution minimizes the formation of biofilms – the ideal breeding ground for germs and bacteria. Compared to other mouth rinsing solutions, no side effects such as taste irritation, changes in the mucous membranes or yellowing of the teeth are to be expected. The same active ingredient complex is also used very successfully in the dental sector for daily oral hygiene. With the pocket-sized mouth spray, Prontolind is always with you. Antibacterial care for oral piercings promotes wound healing and prevents inflammation. With its fresh menthol taste, the mouth spray also provides pleasant refreshment between meals. The mouth spray is also particularly gentle, because it contains neither alcohol nor sugar. 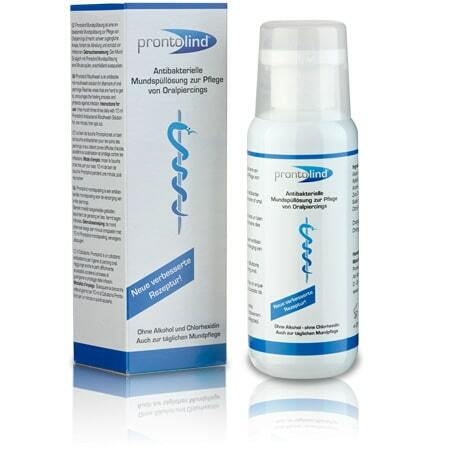 Prontolind Solution is a ready-to-use, aqueous solution for antiseptic cleansing and moistening of fresh and problem piercings. Areas of the skin, mucous membranes and jewellery that are hard to reach can be cleaned. The ingredients have been used successfully in clinical practice millions of times over, are safe for dermatological use. They do not inhibit granulation and epithelialisation, do not demonstrate any cytotoxic, inflammatory, irritating or sensitising properties and can be used safely over long periods of time. In addition Prontolind provides protection from multiresistant (MRSA) and mycotic pathogens and is tolerated well by diabetics and those suffering from allergies. The polyhexanide betaine complex contained in the ingredients decontaminates even areas that are hard to reach. Dispersion of pathogenic, transient and resident bacteria in the piercing hole and around the jewellery is thus prevented. Prontolind is compatible with all modern jewellery materials.